Musician Hudi Greenberger is not only well known as Guitar Man Band, a one man guitar band, but also a much sought after guitar teacher in Lakewood, New Jersey who has taught hundreds of students. Greenberger, who plays for several well known orchestras as well as his own Shir Chodosh Orchestra, is now making basic acoustic guitar lessons available for free on YouTube, with a series of eight lessons titled “Jewish Guitar Lessons”. 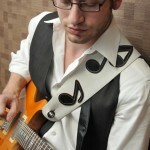 Check out Greenberger at GuitarManBand.com and his great new video series right here on JMR!